Dr. Jason Palm graduated from Louisiana State University Veterinary School in 1999. He has been working at Hiawassee since 2002 and has been an owner since 2003. Dr. Palm tries to give your pet the individual attention he or she deserves. He will patiently review all options for the care of your pet with you. His special veterinary interests include diseases of senior patients, pain management, and the diagnosis and treatment of cancer. Dr. Palm’s hobbies are writing and recording music in his studio at home, gardening with native plants, fitness, and taking nature photos (all the photos hanging in the clinic are his). He has traveled extensively in the United States, Europe, and Mexico. Dr. Ivan Alfonso graduated from Tuskegee School of Veterinary Medicine in 2000. Since then, he has worked in various capacities as a Veterinarian. 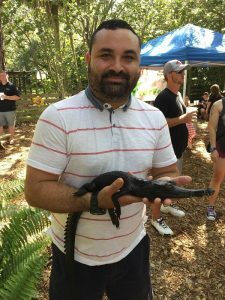 He specializes in exotic animal medicine, especially reptiles. His hobbies include caring for his menagerie of pets which include dogs, cats, parrots, reptiles, and fish, doing research work in Indonesia several times a year, and beer tasting with his wife. He will give your furry, scaly or feathered pet the same dedication and care as he would his own. Hi there, I have been with Hiawassee Veterinary Clinic since November 1992. My love for the animals and what we do for them is what has kept me here. I still learn something new every day whether it is administrative, medical, or mechanical. You may see me at the front desk, in the hallways, or not at all … whatever the day brings me. Outside of work I enjoy time with my husband and son, sometimes get to cook or bake, and may even find time for my garden. Hey! As a staff member since 2005, I find myself not only in love with my career as a Veterinary Technician but also as a performer. Helping animals by day, entertaining an audience by night is among my talents. Some may know me as Nicki Jay. I enjoy taking on challenges and truly believe there is always room to grow as a person. Cheese is a huge love in my life. Physical and mental health is extremely important to me. Sleep = my hobby. 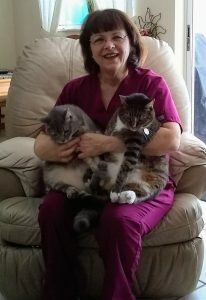 As a pet owner, Cheddar and Mr. Kitty, the two household cats, that dictate my life and funds, are the loves of my life. PepperAnn will always be my #1 best friend. I had the honor to call her my fur baby, 12 years out of the 15 fruitful years she lived. Hey guys, my name is David and I have been working at HVC since 2008. I started working in the kennel area and worked my way to full-time tech. Animals have always been a big part of my life ever since I was a little boy. People that know me call me “Dr. Dolittle” because of my passion and love for animals. I love my job and I come to work every day thankful for what I do. At this point in my life, I have decided to go back to school and become a veterinarian so that I can continue working with the animals that I love. One other fun fact about me is that I am a bit of a geek I love to read (anything sci-fi or fantasy), and I am a big Harry Potter nerd (yes I have the wand and everything). Now that you have read this come in to say hi and have a magical day. Hey everyone, my name is Juan Perez, and I have been working for HVC since August 2010, but I’ve been working in this field since 2002. I’m originally from the Bronx, N.Y. and that’s where I learned a lot about animals and the field itself. I also love to draw and have started my own little project in the boarding facility here. I have a very strong passion and respect for pit bulls; this is why I own three. My goal is to run a pit bull rescue so I can help this misunderstood breed. I come to work every day with a positive attitude because, although I’m not a veterinarian, I feel as if I make life a little better for the animals in general. I love this job and work very hard at it because working in this field has made me respect the little things about animals that a lot of people don’t notice. I want to further my knowledge of animals so that one day I can become a veterinarian. Hi, I’m Ashley. I have been working in the animal field since 2001 in various positions, which has taught me a lot to better assist you. I started working at HVC in 2013 and am glad to be working under the best vet Dr. Palm. I love what I do for a living for two reasons. One I am an animal lover (but who here isn’t) and two, I enjoy helping people. I am the proud mother of two wonderful boys, Troy my oldest and Jeremiah my youngest. They are the world to me, and the reason I get up every morning. Besides them I also love anything with butterflies, working out, and cooking. That’s just a bit about me and I do look forward to meeting you. Hello everyone. I have been a veterinary technician since 2007, mostly specializing in avian and exotics. Reptiles are my passion and have been for as long as I can remember. I am fascinated by everything reptiles; their biology, their husbandry, their origins and their conservation amongst other things. 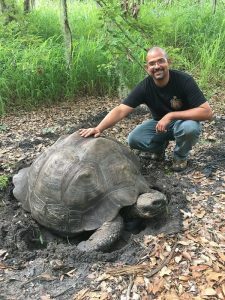 On my free time, I work with different reptile rescue organizations such as Turtle Rescue USA, Turtle Conservancy, Florida’s Parrot Rescue and TSA among others. My goal is always to help in primal care and conservation of the species including endemic species. I strive to give all of my customers the best of care, anticipate their needs and make sure their owners feel heard and taken care of. Hi everyone, my name is Becky. I have been working at HVC since December 2018. I enjoy working here because I meet so many wonderful people and their pets. I’m originally from Mississippi. I am a lifelong Louisiana State University Tiger fan and a New Orleans Saints fan (just like Dr. Palm). I love animals and have two cats, Hoshi and Tsuki, that live with my husband and I. We have 2 children, Jessica and Kalem, and a granddaughter Olivia. My husband and I enjoy riding our Harleys, watching all kinds of sports, and working in our yard. I have a passion for being creative and I feed this passion by sewing, building things, and creating items from recycled products. You can see some of these displayed in our office and at Becky’s Busy Bee Boutique on Facebook. I look forward to meeting you soon. Have a wonderful day!